The medical officer at the RML hospital said the tissues had been preserved and the blood samples of Lal Chand's relatives would be taken, adding that the DNA profiling would take a couple of days since it also involved the role of the Forensic Science Laboratory. 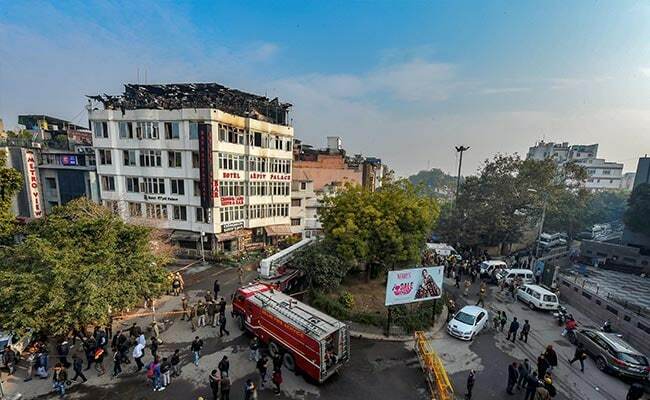 An unidentified and badly-charred body, recovered from Hotel Arpit Palace in central Delhi where a fire claimed 17 lives on Tuesday, would be subjected to DNA profiling amid a desperate search by the family members of hotel staff Lal Chand, who remained untraced after the tragic incident, officials said on Wednesday. The family members of Mr Chand described him as a heavily-built man. They were in a state of shock when asked to identify the body at the mortuary of Ram Manohar Lohia (RML) hospital as it was beyond recognition. "At least five members of our family went to identify the body, but it was charred to such an extent that we could not identify it. He was a heavyweight man. Hardly anything is left (of the body), only the skeleton. The body has compressed. How can we claim the body when we are not sure?," asked Kamlesh, a relative of Mr Chand. Since the body is charred beyond recognition, officials are now opting for DNA profiling to ascertain if it is that of Mr Chand. The medical officer at the RML hospital said the tissues had been preserved and the blood samples of Mr Chand's relatives would be taken, adding that the DNA profiling would take a couple of days since it also involved the role of the Forensic Science Laboratory. Mr Chand's family has been running from pillar to post to trace him. His elder brother, Tulsi Ram, along with Mr Chand's son Himanshu and other members of the family, visited at least five hospitals since Tuesday morning.